Take SyringePumpPro for a Test Drive! I encourage you to take a test drive of my software and see how helpful it can be in working with your laboratory pumps. Please test my support by asking me a question or lots of questions – I answer them! – the chap who writes the software answers your questions! All correctly configured and connected pumps are detected and will be forever – even if you never purchase a license. You can use all features to control the first pump detected on launch for 14 days. The trial software is the full version, with a temporary single pump license activated for – 14 days AFTER your first pump is detected. If you never purchase a license key – the software will detect and monitor pumps FOREVER! Handy diagnostic tool for your pumps. 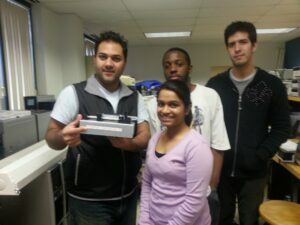 Hey LabVIEW and Matlab people this is useful! Will it work with my pump? Check my compatible pumps page to see if your pump is listed. 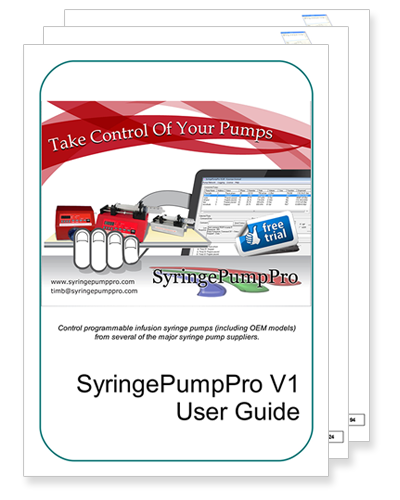 Hint if the pumps you’ve seen so far on this website look familiar – SyringePumpPro probably supports them. Trouble downloading? Please contact us – we will fix it! If you experience connectivity issues – please contact me and I will help you get them solved. Hint – it’s your wiring or pump address configuration.